When I first started to teach jewelry making, I was always scrambling to pull together my tools before taking off to class. There is a standard subset of tools that I use for most projects I work on, whether wire work, or beading, or working with metal, so I decided to make up a simple tool kit with the items I use the most, so I can just grab it and pack it with my other supplies. 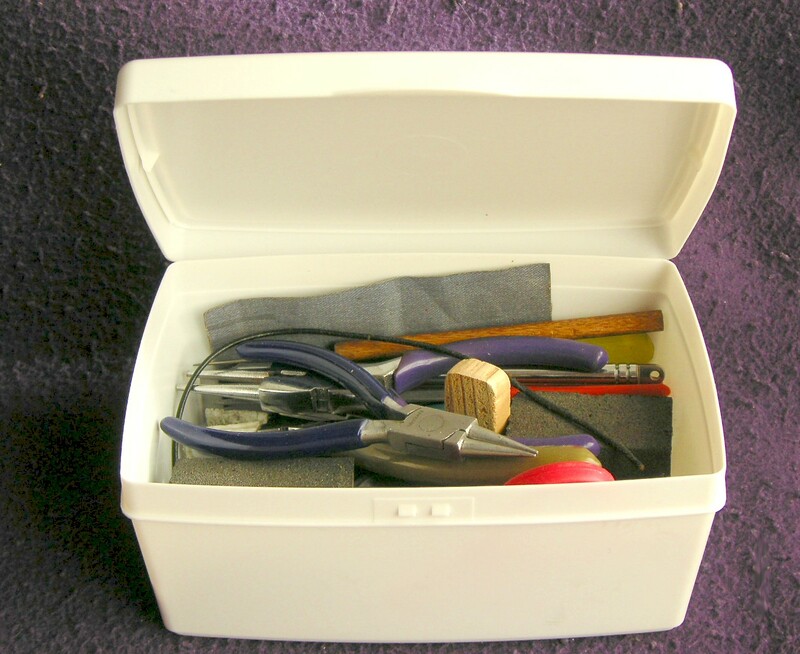 This is my tool kit… not some case with elastic loops (never big enough! ), but a baby wipes container! Filled with the tools I use every single day…. And the case has a little extra room, so I can always add an extra tool when needed. Flush Cutters: a sharp point, and a clean edge are a must! And these cut wire as heavy as 14g with no problem. Round Nose Pliers: I have 2 pairs, since I use a variety of gauges. Knotting Pliers: although these are intended for knotting, I use them all the time with wire. They are great for tucking in thin wires. Bent Nose Pliers: I have discovered that I reach for bent nose pliers so much more than chain nose pliers. I used to keep chain nose in the kit, but I don’t use them much – the bent nose work most times for me. 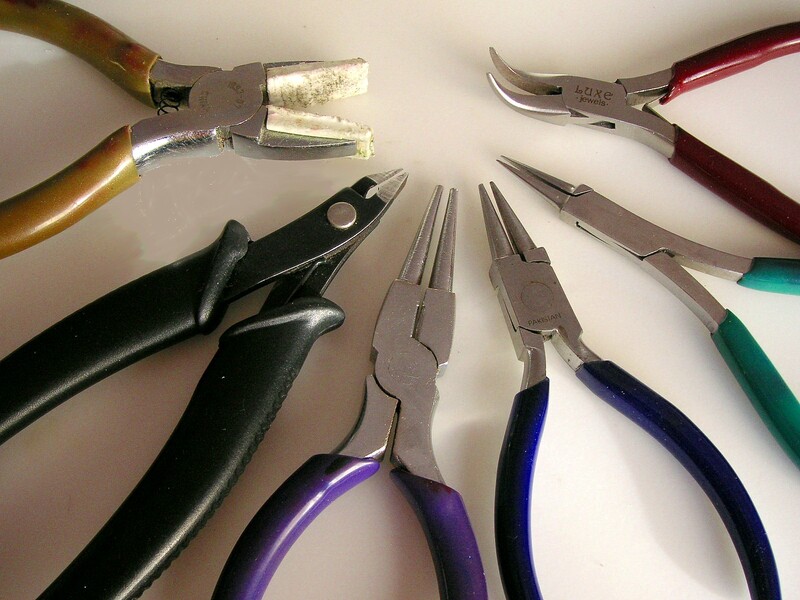 Pliers are the basics, but they’re not enough! I always need files, and I found a small 3 piece set that has a great cut. 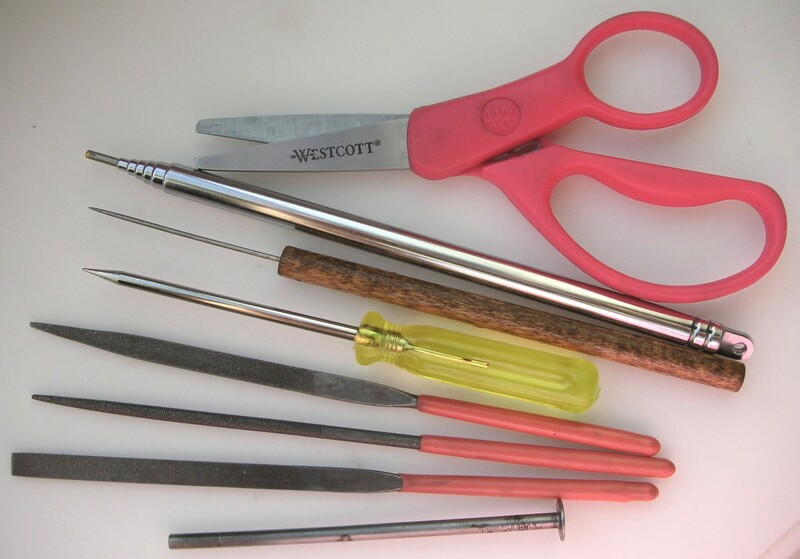 There are also 2 awls (aka “pointy metal sticks!”) that I use all the time – the yellow handle one is thicker, and great for enlarging small holes in metal, and for breaking beads. The nail, at the bottom of the photo, has been altered… I cut off the point and filed, sanded and polished the end, so I could use it as a burnisher to smooth out metal surfaces. And the extendable antenna is my portable mandrel, used when I need to shape wire and make coils. 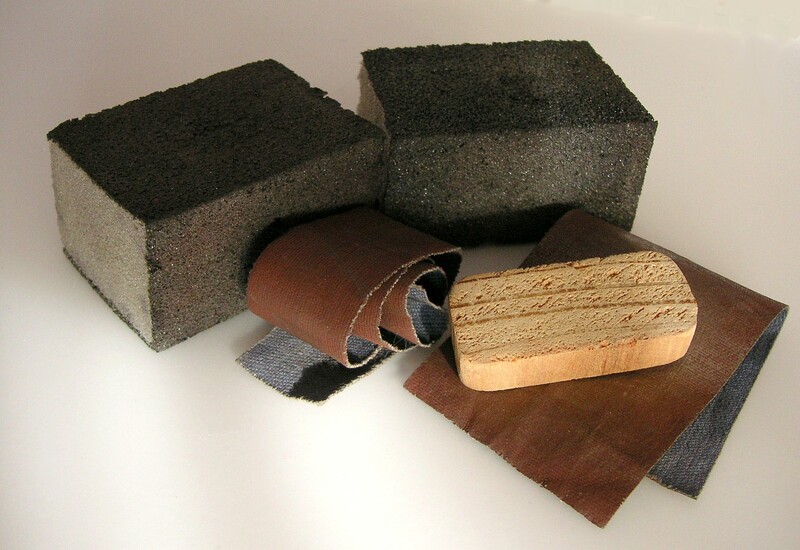 I can’t begin to tell you how often I use sanding blocks… ! These are 1/4 size cut from a standard block, and I use them to soften a metal surface (wire or sheet) after filing. I also use them to add a subtle texture, and to clean off oxidation. The crocous cloth is something I was shown years ago… it is a textures grit “painted” onto a heavy denim cloth, and it is great to polish up metal apply a shine – just be sure to NEVER use them wet, because the grit will run! For most classes, I also need to grab a few other items – for many projects I need to include steel blocks, stamps, punches, and hammers. But having all these basics in one simple case ensures that I all I need to do is add the project specific tools. And as a little time bonus, I keep this sitting in my living room, so whenever I feel a bit creative, it’s always where I need it!